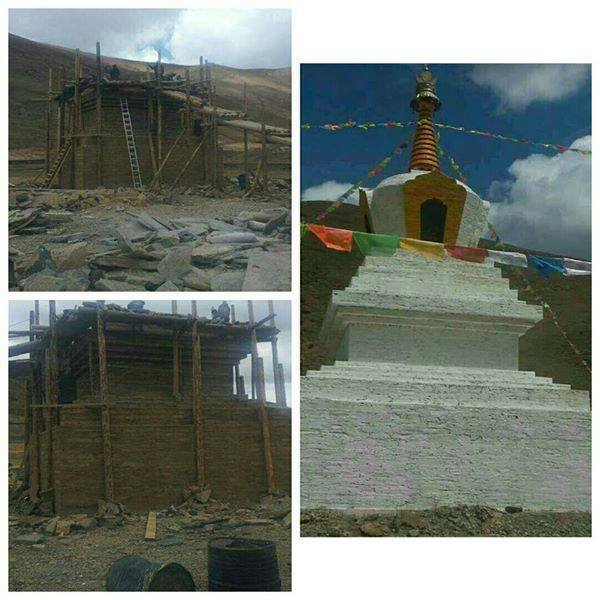 The Stupa was completed in May 2014 !! Peace of Tibet is a local non-profit project that is building a Stupa in a remote village of Tibet where there is no access to this ancient tradition. The project is sponsored by the Center for Sacred Studies and was founded by Anny and Yeshi. The Peace of Tibet Stupa Project is a local non-profit project founded by Anny and Yeshi, and is sponsored by the Center for Sacred Studies, an organization dedicated to preserving indigenous cultural and religious traditions around the world. The project is an effort to construct a Stupa in a rural Tibetan village where there is a need for a central place of prayer, and is the vision a local Tibetan man and his love for the elders of his village. The remote location of this village makes it impossible for the elderly residents, and children, to make the long journey to the nearest Stupa. Thus they do not have a central place of prayer at this time. The effort is especially important during this time when indigenous traditions are in great danger. While there is awareness that prayer can happen any time and any place, the Stupa will be built with the intention of preserving indi genous Tibetan traditions which are currently facing increased deterioration. Although there is a monastery in the region, it is too far for the elders to visit for worship. The village was at one time entirely nomadic, but because of the current political situation, they have been forced to construct permanent homes and change their way of life that has existed for hundreds of years. Your support will give this village access to this special tradition. It has been believed in the Tibetan tradition that to contribute in any way to the construction of a Stupa provides benefit to the donor, accumulating merit and purifying negative karma. A Stupa is a beautiful structure that houses the spirit of Buddha and serves as a central location of prayer and worship. The construction of Stupas for prayer is a 2,500 year-old tradition to help transform and purify imbalance. To preserve indigenous Tibetan traditions. Share the post "The Peace of Tibet Stupa Project"